Hi, I am new to LabView, but I would like to try to connect U2000 Hitachi UV-Vis Spectrophotometer to a PC Via Rs232C. This U2000 is a standalone machine. Anyone could help, Can I use Labview to do this task. Please help. Thank you. First you need to know if your PC has serial port or only USB ports. In case you have only USB ports you'll need to convert the data from your device to USB using a serial-to-USB converter. 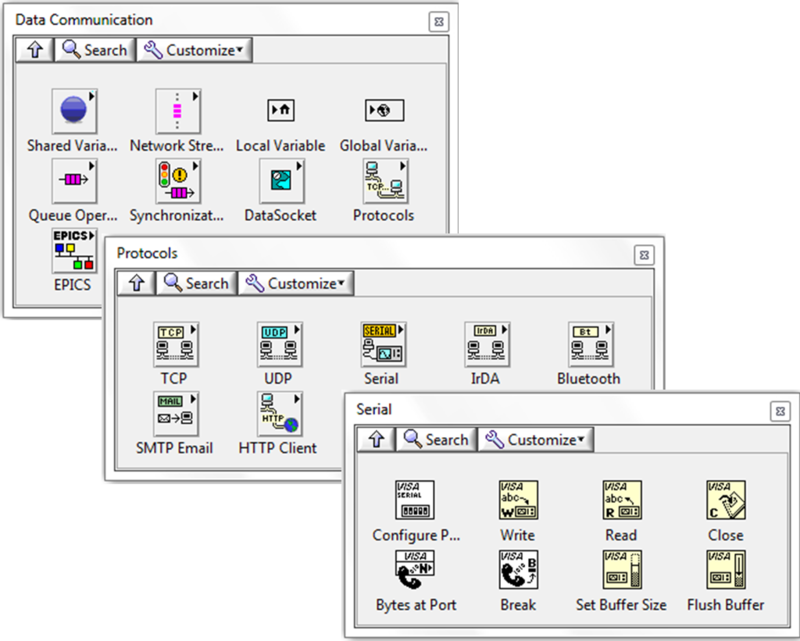 It's very easy to make LabVIEW to "hear" a serial port (even if connected to a USB port) using VISA (check at 'All programs > National Instruments > VISA'). You'll find the proper nodes at the functions pallete at 'Data Communications > Protocols > Serial' (I've attached an image). Using the nodes is pretty simple, remember you have Ctrl+H to view the context help and also the detailed help option to fully understand every block and even to find examples. Hope this works, let me know! I don't know if you are asking about collecting data (¿? ), if so, you only need to use the "Read" node shown in my las post, and use the necesary inputs to get the ASCII interpretation of what your device is sending. Node inputs' are the configuration parameters of any serial protocol like baudrate and parity, those depend on your specific machine. There is one input which asks you for the port in which your device is connected; even plugged in an USB port, a COM number will be assigned to your device and you need to check it from the "Device Manager" (If using windows) and select it as an input of the node. The output will be an ASCII string of the recieved data so you can later use the string nodes to manage and convert it. Consider that most of the times, the driver installation is needed before you can start using the connection. Thank you for response again..
My real problem now is the instrument driver and not the serial/usb driver. As I understood that we can create the instrument driver using the NI, but I dontknow how, that why I came tothis discussion forum....Hopefully you could show me how to create the instrument driver. I did go to the "measurement & automation explorer", "Instrumentation/find instrumentation driver" but none available. Perhabs you could show me how. Thank you. I think there is no need to make a driver... If you are catching raw serial data, it is possible to work with it due to the versatility of the string operations offered by LabVIEW. Everything should work fine if the communication is set to be serial and its parameters have being configured correctly. Sent bits from your device will arrive to the serial port buffer and will be available for reading in binary, hex or ASCII format (ASCII is the default when using Serial inside LabVIEW). Hello, I am MSc student and I am trying to work on a hitachi U2000 spectrophotometer, but I seems impossible to find its manual. I also want to connent it with a pc but I really do not know what and how to do it. I am not even sure if I can connected to a pc (with Windows xp or windows 7 operation system). Is there any solution to my problems? Do you know where I can find the manual?